Sitting down to take your boots off at the end of a tough mountain day the last thing you want is to put on a pair of damp, cold shoes. 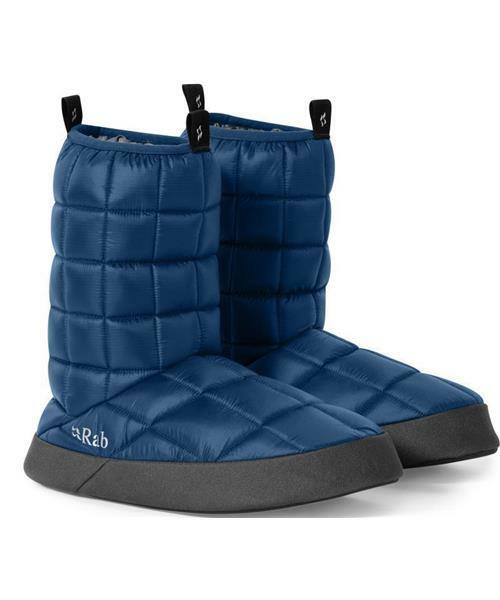 Filled with plush, warm synthetic Cirrus insulation, Rab's Hut Boots cacoon your feet, offering welcome warmth and comfort. Hut Boot is rated 4.5 out of 5 by 2. Rated 4 out of 5 by in Revy from did as promised I spent 3 days in a rustic hut shortly after receiving this hut booties as a gift. They didn't get wet (even though the floor was wet at times) and kept my feet warm and comfy. Rated 5 out of 5 by Lilly from Perfect hut booties I bought these at the beginning of ski season and they're wonderful and warm! Run slightly bigger than what you would think -- ie. I'm an 8 womens and got a M and they are HUGE, but awesome.